The WBC Welterweight title is on the line in Las Vegas this weekend as Floyd Mayweather Jr. squares off against Rick Hatton Saturday night at the MGM Grand in Las Vegas. Bodoglife.com has the early beat on this fight as has Mayweather pegged as the early favorite in this bout. These odds and more props are listed at Bodog. Check it out now! Floyd Mayweather Jr. is the current super welterweight champion of the world. He is 38-0 in his professional boxing career, with most of his wins coming via technical knockout. Mayweather Jr. has beaten Oscar De la Hoya, Carlos Baldomir and Zab Judah in his past three fights. His last three fights have also all went 12 rounds. Ricky Hatton is one of the greatest British fighters of all time. His professional boxing record is 43-0, with 32 of his wins coming via technical knockout. 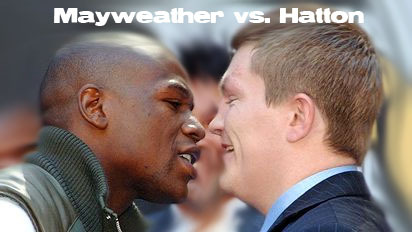 In his past few bouts Hatton has beaten Jose lUis Castillo, Juan Urango and Luis Collazo. The early betting money thus far has been on Mayweather, and many people have been backing him in a large way. Popular boxing journalists and bloggers have all been spouting this as a one sided bout, and many casual fans see the fight playing out that way.